Peter Gabriel is one of contemporary music’s great experimenters. From his work in the progressive group Genesis, through his pioneering solo albums, to his enthusiastic embrace of world music and new technologies, Gabriel has remained steadfastly consistent in his redefinition of music’s boundaries and influence: geographical, virtual and thematic. At the heart of Paul Hegarty’s astute analysis is the idea of locatedness: what it means to be in a specific place at a given time, and to reflect on that time and the changes which inevitably occur. Gabriel’s work, Hegarty argues, can be understood as a series of reflections on the ‘where’ of being – and this includes politics, psychology, philosophy, psychogeography and inward reflection. Peter Gabriel offers a nuanced and trenchant insight into this enigmatic musician and his works, an artist whose constant travelling – through identities, influences and media – defines him as one of modern culture’s truly global citizens. 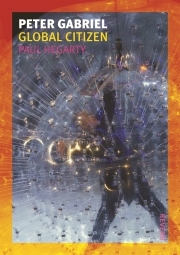 Paul Hegarty is Professor of French and Francophone Studies at the University of Nottingham. He performs in the noise band Safe, and his previous publications include Noise/Music: A History (2007) and Rumour and Radiation: Sound in Video Art (2015).